Put a large saucepan of water on to boil. 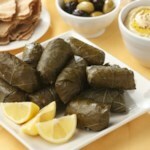 Remove grape leaves from the jar and unroll. Separate into two piles—one of whole leaves and one with any torn leaves or pieces of leaves. The whole leaves will be used for rolling. Set aside the others for Step 5. Cook the whole grape leaves in the boiling water for 5 minutes; drain in a colander. To prepare filling: Combine lamb, rice, parsley, mint, marjoram, oil, cinnamon, cumin, salt, pepper and allspice in a medium bowl until well combined. Place the torn or very small leftover grape leaves in a large saucepan, covering the bottom completely; this will prevent the stuffed leaves from sticking as they cook. (No leftover leaves? See Tips.) 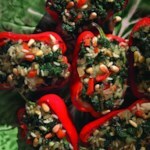 Place about half of the stuffed grape leaves in one tight layer in the pan and drizzle with 2 tablespoons lemon juice. Make a second layer of grape leaves on top of the first and drizzle with the remaining 2 tablespoons lemon juice. Place the largest heatproof plate you have that will fit in the pot on top of the grape leaves. Place a small-to-medium heatproof bowl on top of the plate and fill it three-quarters full with water (this will act as a weight to keep the grape leaves submerged). Add water to the pan until it reaches the rim of the plate. Carefully remove the bowl and plate, then transfer the grape leaves from the water using a slotted spoon. 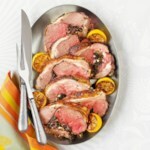 Serve warm with lemon wedges and yogurt for dipping, if desired. Notes Jars of grape leaves can be found with other Middle Eastern ingredients in large supermarkets, Middle Eastern markets, natural-foods stores or online at amazon.com. We like the texture and quality of Sadaf, Ziyad, Roland and Yergat brands. If you can only find a 32-ounce jar, you can freeze the leftover leaves in an airtight container for up to 6 months. If you have access to fresh grape leaves, you could harvest your own to use instead. Select medium-size leaves from unsprayed grapevines in late spring or early summer, when they will be at their most tender. Tips: No leftover leaves? If you don't have any leftover leaves to line the pan, cut a potato into ½-inch-thick slices and place in the bottom of the pan to prevent the stuffed leaves from sticking. How to Arrange stuffed Grape Leaves in the pan: The stuffed grape leaves should be tightly packed in your saucepan to prevent them from floating up and unwrapping during cooking. Working with about half of the stuffed grape leaves, nestle them into your pan in concentric circles, working from the outer edge toward the center. Make a second layer directly on top of the first with the remaining stuffed grape leaves.